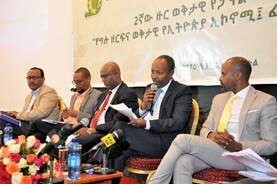 Addis Chamber to Emerge as a Major Policy Stakeholder. The public sector alone cannot afford continuous economic development in the country said Telaye Kassahun,(PhD). The government rather should be limited to in regulatory and controlling activities, he added during the 2nd panel discussion organized by Addis Chamber of Commerce and Sectoral Association 16August, 2016 at Hilton hotel. Eyob Tekalegn, National Planning Commissioner of the FDRE, who was also a panelist in reference to the private sector and the GTP, said that the government looking for strong culture of public-private cooperation. The government has separately designated the private sector as an engine to the national economy in an effort towards industrialization, the commissioner said. A series of consultations were made involving stakeholder over the performance of the GTP-2. The feedbacks show there are huge gaps in major economic performances such as export, macroeconomic instability and foreign debt. Gaps accounted in the major economic performances over the last years under GTP -2 are calling for serious action. The importance of the private sector is not only for economic performance but also shouldering the burden of unemployment, Eyob said. As was the reform in the politics was made, now the government is working seriously on ways to redefine the role private sector in the economic development process, the Commissioner added. The Commission is now drafting a 10 year development planning where all stakeholder would participate including the private sector. To that end a new economic advisory team reporting to the Prime Minister has been set up to speed up the process. Other thematic topics included ‘Private Sector and the Current Ethiopian Economy Challenges: Private Sector and the Tax System’ by: Amin Abdella ‘Challenges Against Export Performance’ by Million Bogale; “Tax System: Challenges on Privates Sector and Possible Solution” by Tesfaye Mergia. Several intervention were forwarded from the audience coming from different walks of life and to which explanations were given by panelist. As part of the ongoing efforts in place and to contribute in addressing to the challenges the manufacturing sector face, Addis Ababa chamber of commerce and sectoral Associations has initiated a wheat value chain study with a view to manufacturing sector in Ethiopia. On welcoming speech of the workshop, Secretary General of AACCSA, Ato Getachew Regassa said that such type of value chain studies have crucial contribution for the improvement of wheat production in Ethiopia. Since wheat is among the most nutritious cereal crop, it has to be produced widely. Moreover, to ensure high level production and productivity of wheat and satisfy the whole wheat value chain actors and consumers there is a need to utilize improved wheat manufacturing technology, he stressed. Wheat is an important staple food in the diets of many Ethiopians. Its production and marketing becomes the means of livelihood for millions of small holder households. It is also a critical raw material for the domestic wheat industry, which provides an important contribution to employment opportunity and value creation activities in the agri-food sector. In the workshop, consultant of the study, Ato Assefa Hagos presented an overview of wheat value chain analysis in Ethiopia. According to him the strategic importance of wheat production has resulted in a strong involvement of the State and many other stakeholders at all levels of the wheat value chain. The survey result investigates wheat value chain actors and their value addition roles, analyze major constraints facing manufacturing industries and determine possible strategies for economic actors superior value creation activity. During the survey, manufacturing industry participants were asked about what really? The survey result also found in rank order that determines most the quality of their wheat products include; quality of raw material, efficiency and factory plant type, employees work knowledge and Company Leadership. According to Assefa Hagos, the consultant believes that effective wheat value chain industry in Ethiopia could be made possible through a Fundamental Transformation – Meaning adding meaningful value to a wheat value chain.He added that marketing exchange doesn’t rely on the maximum of learning about customer needs and designing new product offerings to suite those needs. The study pinpoints that linkage among chain participants is very weak. Participants in the work shop pointed that traditional way of transaction is one of the challenges in the wheat value chain. So, they stressed to focus on the value creating system, where growers, suppliers, milling industries and customers work together to create value. The study recommends to the needs of reconfiguration of roles and relationships among actors.Agricultural machineries can be acquired through different means; via cooperatives, farmer’s unions and association or close relatives and interested groups coming together, etc… Growers and milling industries should make a close relationship to create value way beyond focusing on economic value creation only, the study indicated. Manufacturing industries must actively involve in improving organizational leadership by focusing on a supply chain activities. Economic Power is still in the hands of growers not consumers, hence company owners should work for an environment of abundance so that they may see economic power shift to consumers. Addis Ababa Chamber of Commerce and Sectoral Associations organized discussion on the benefits of newly established ICT Industry Park to local business for its members. Incentives the government identified for companies joining the park are not implemented; it was indicated on the occasion. The event took place at Hilton Addis on December 22, 2016. A CEO of Africom technology, which is one of the companies in the park, had a presentation on the advantages of working in the park as well as the challenges faced. There is fast internet connectivity within the park, power supply is good, land lease price is very low, the CEO, Ato Baheru Zeyenu, said. Moving on to challenges he said, government incentives are not implemented yet, funding for knowledge and ideas is problematic. Participants have also expressed their part. Although internet connectivity within the park is good, interface with outside is difficult. The government plans 300 000 jobs to be created within the park and yet it is not explained how that is possible. Problems of park facility management, transport, and security were also raised. The park helps for networking and sharing badly needed infrastructure, Ato Beheru said. While a government official responding to a question regarding requirement to enter park said that being export oriented, creating jobs, and import substitution are important considerations for the government. Addis Ababa Chamber of Commerce & Sectoral Association (AACCSA) conducted the first Information Technology System (IT) Sector Value Chain Networking on Thursday December 1, 2016 at Maria Hotel. The Networking Event was part of the manufacturing advisory service network establishment activities and prepared for the purpose of unleash the potential of IT sector to manufacturing sector.